Techni Waterjet , Melbourne has won the prestigious Innovation Award ‘Award zur Euroblech 2010’ for their Quantum Electric Servo Pump (ESP). 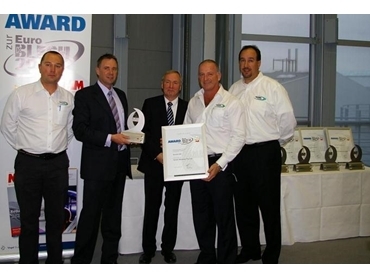 The award was presented by MM Maschinenmarkt and Blechnet, Vogel Business Media, Germany to Techni Waterjet at Europe’s international sheetmetal show Euroblech 2010. Quantum electric servo pump has been developed in-house by Techni Waterjet after 3 years of R&D as well as $2 million in expenditure and offers high-pressure waterjet cutting with innovative direct-drive technology. According to inventor and Techni Waterjet Managing Director Darren Reukers, the ESP is one of the most efficient waterjet pumps available on the market, delivering real efficiency gains and real savings in operation. Quantum electro servo pumps are designed to only use power required for the cutting process. No additional power loss occurs regardless of whether the cutting head is open or closed, or the pressure or flow is reduced. Mr Reukers says that they decided to replace the traditional hydraulic cylinder used in intensifier pumps with a servo motor at the design stage. Their experience in building their own servo motors from the 5-axis PAC head, a Techni invention helped them with Quantum. The direct servo technology was first applied by NASA for the Space Shuttle Program by replacing old-fashioned hydraulic cylinders with new, highly compact, efficient, reliable and infinitely controllable servo linear actuators. Similar actuators are used today in many high-end machine tools and presses replacing inefficient hydraulic systems.